The doors for this year’s edition of TEFAF , the world’s leading art, design and antiques fair, opened last Thursday. The preview was attended by almost 10,000 invited collectors and museum buyers and after only ten minutes the first piece was reportedly sold, namely The Conquest of Tyro by Giovanni Antonio Guardi (1699-1760). This fair offered attendees the best of the best and Barnebys is here to present you with a few of this year’s highlights. In the classic antiques section we find dealer Charles Ede, whose impressive collection of antique items includes this portrait that is believed to be the oldest piece in the entire fair. The portrait was painted on a thin piece of wood and depicts a young woman from the Roman-Egyptian period, from around 200 AD. What makes this portrait so special is that it clearly blends the Egyptian and Greek traditions while also representing the jewelry and clothing of the time. During the woman's lifetime the portrait was hung on a wall and at the time of her death it was placed over her face after her body was mummified. This sculpture with an astounding backstory is proudly displayed at The Merrin Gallery. 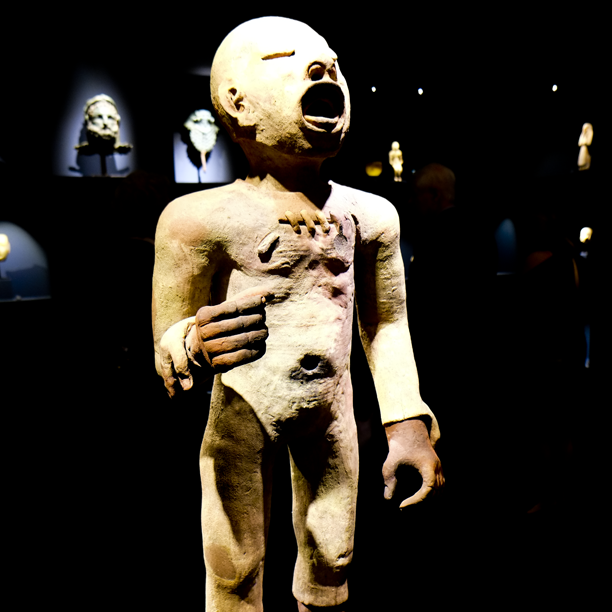 The piece reveals a piece of Mesoamerican history as the sculpture depicts the practice of flaying a human being and then sewing their flesh onto the village priest in order to honor the god Xipe Totec. The sculpture is made of terracotta and the actual human flesh that covers is said to be between 2,500-3,200 years old. You can read more about the sculpture and it's astonishing history here. Le Moulin d’Alphonse Daudet à Fontvieille (1888) by Van Gogh hos Dickinson. Stand 402. We leave the antique portion of the fair and move towards the art section where we find this drawing by Vincent Van Gogh in Dickinson's stand. 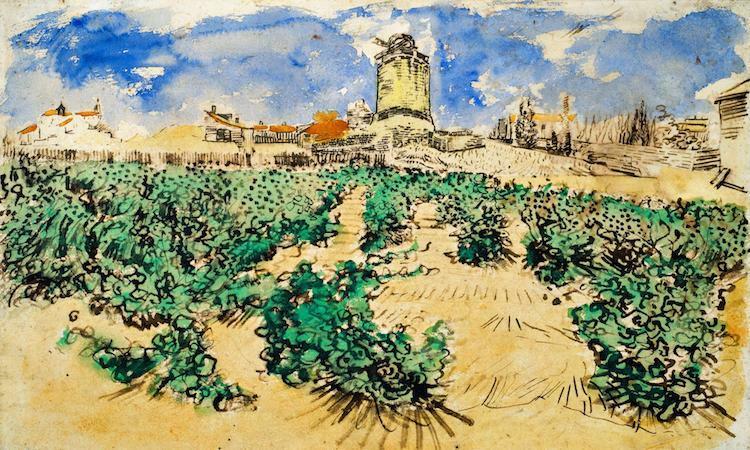 This piece, named "Les Moulins", is on display for the first time in over 100 years and depicts the landscape in Arles in Southern France where Van Gogh stayed in 1888. It has been part of different private collections in Europe since 1910, and now it has been made available for public viewing. Andy Warhol at Van de Weghe, Stand 502. 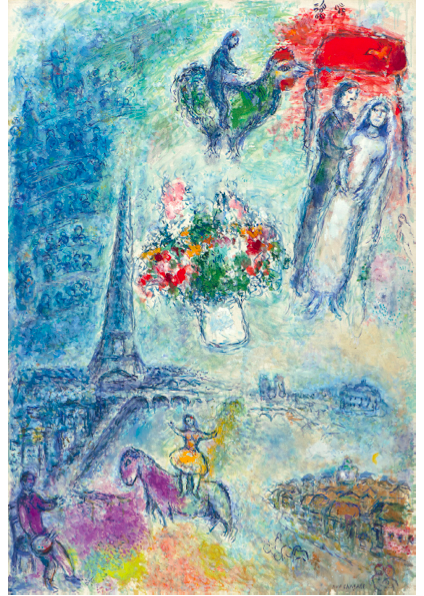 Marc Chagall "The bridegrooms in the sky of Paris", 1980/81 at Galerie Boulakia. At these types of fairs it is not uncommon for one or two names to pop up more frequently at the dealer's displays. This year we have been treated to many pieces by Andy Warhol, Jean-Michel Basquiat and Marc Chagall. 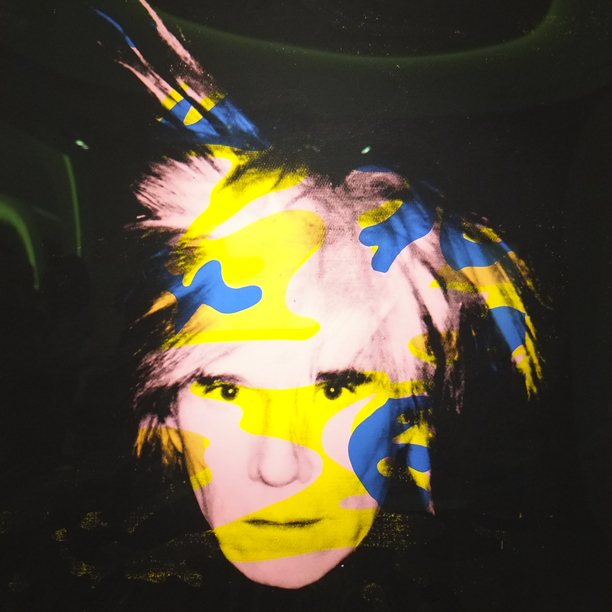 This self-portrait of Warhol from 1986 can be found at the New York gallery Van de Weghe Fine Art, who diligently exhibit modern and contemporary art at the large fairs around the world. Works by Andy Warhol can also be found at the Paris based dealer Galerie Boulakia who, with a total of six pieces, have built a miniature exhibition dedicated to Marc Chagall in their stand under the theme "the sweetness of life". T.v. Demetz, "Daddysboy" 2015. T.h. Yi Hwan-Kwon "Ju-Ha" 2013. Gerhard Demetz's sculpture "Daddysboy" has got to be one of the fair's youngest pieces and can be found at the German gallery Beck & Eggeling. 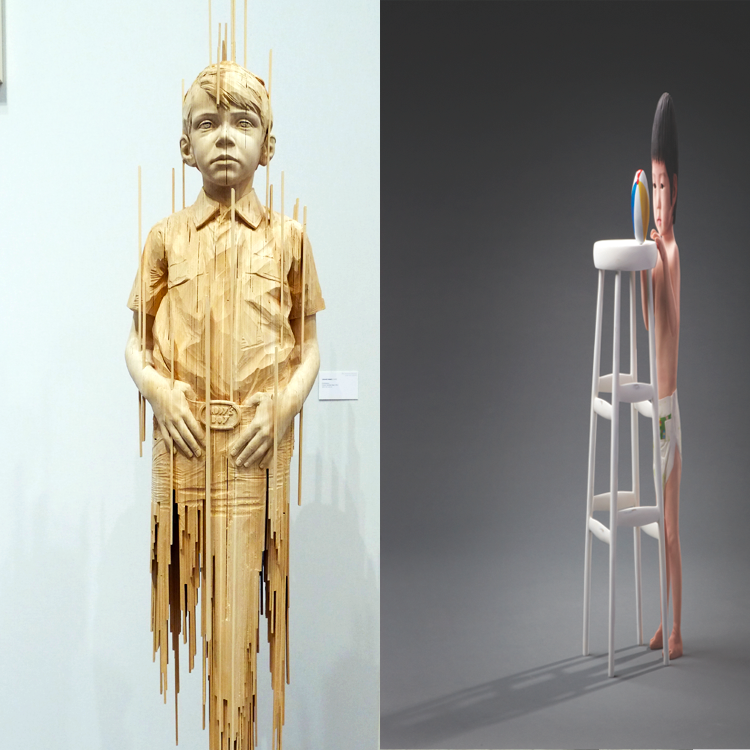 Demetz has been garnering attention with his sculptures of children, made out of wood with technical perfection. The Korean gallery Gana Art also offer a sculpture of a boy, created by Yi Hwan-Kwon in 2013. Hwan-Kwon is one of the most noted Korean artists today and his work is inspired by both film and day-to-day life. The sculptures challenge our subjective perception of time and space, it does feel like you're wearing a pair of 3D glasses when you look upon his sculptures. Piece of jewelry from S.J. Phillips, Stand 114. 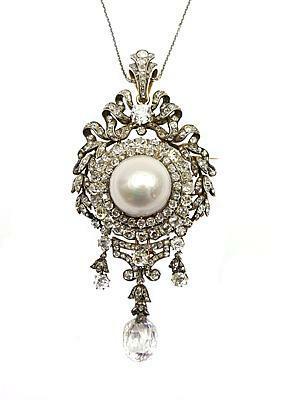 The jewelry and gems section offers this pearl and diamond piece. The piece is named Eugénie after Eugénie de Montijo, who in the mid 1800's was married to Napoleon III and kept the piece in her private collection until 1870. The following year it was sold several times before making it's way in the possession of Reginald Gervis Hargreaves who gifted it to his future wife Alice Liddell as a wedding present. Alice Liddell was also the inspiration for Lewis Carroll's book "Alice in Wonderland". The piece is now for sale at S.J. Phillips for around five million dollars. Galerie Downtown François Laffanour with Phillipe Ségalot in the forefront have collected Shaker furniture for the past five years, now displayed in their stand at TEFAF. 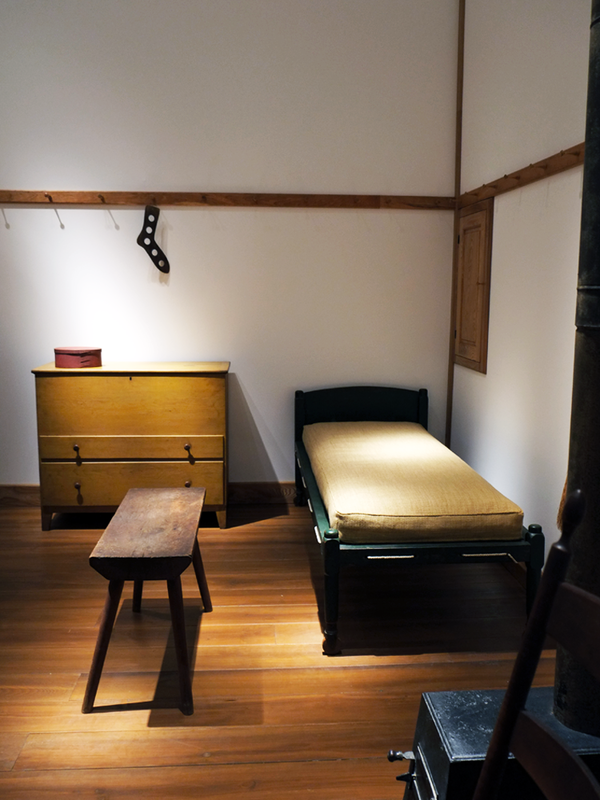 Many Scandinavian designers were inspired by the Shaker design and these 30 or so pieces of furniture illustrate how a real Shaker home could have looked. Read more about TEFAF here!